Variety and safety are factors to consider when choosing the number of perches. 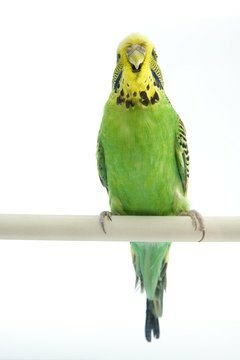 The appropriate number of perches for a budgie's cage depends on the size of the cage and how many birds share it. Too few perches will be boring to the adventurous budgie's nature, while too many can be dangerous. Considering several factors will help you decide what's right for your bird. Parakeets, or budgies, love to climb and explore their environment from different angles. Perches placed at different heights let them fly or hop from one to the other for exploration and play. So a minimum of two perches, placed at different heights, are a must for every parakeet cage. Most cages come equipped with two perches that attach to both long sides of the cage. While some experts recommend discarding these in favor of smaller, natural perches, their length is ideal if you keep two or more birds in the cage. Many parakeets enjoy hopping side to side on them or exploring toys along their length. Caged birds need exercise, and a variety of perches give them a reason to fly, and jump back and forth between them. Shoot for having perches at opposite ends of the cage so he gets exercise every time he goes from one perch to another. Whether you have two or more perches, make sure they are made from a variety of materials and are of varying diameters. Birdies need to stretch their feet as well as their wings, and perches of different sizes create a natural stretch when they alternate perching on them. The types of perches you use can provide a number of different functions. A cement perch is good for keeping nails and beaks trim, while wooden perches satisfy chewing instincts. Cotton rope perches have an entirely different feel, and budgies like to peck and pull at them.You're the only one who has to know that variety in perches is good for them. They just think they're having fun. So, if two of your perches are the smooth wooden dowels that came with the cage, you'll need at least one more perch of a different sort for variety. Be sure to check perches for wear and loose pieces or strings that can become dangerous. Many budgies like to sleep on a perch high up in the cage. It could be a swing, a short, stationery perch, or just a favorite spot next to a cuddly toy. The sleeping perch isn't reserved just for sleeping; chances are your budgie will use it throughout the day, too. Just make sure he has one high perch, in the top third of the cage, and then let him decide where he feels comfy sleeping. Your budgie or budgies should be able to spread their wings easily in the cage, and fly or jump from one perch to another, without bumping into perches, dishes, toys or other accessories. Even short perches can become dangerous obstacles if she has to skirt around them all the time. If you have more than one budgie, both need to have room for safe flying. The more perches in the cage, the less room for the other accessories birdie needs. Should Cockatiels Have Glass Mirrors in Their Cages?